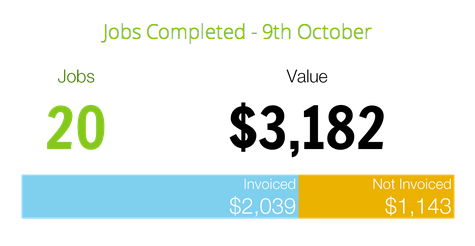 The Jobs Completed report gives a quick summary of your business activity for the day. The display of invoiced versus non-invoiced value can be used to determine how quickly you're invoicing your clients. The quicker you can generate and send invoices, the quicker you'll get paid. - Number of jobs completed: this is the number of jobs whose Status was changed to "Completed" since the last time the report was generated. - Value of jobs completed: the total value of Materials/Services within the completed jobs. - Invoiced: the total value of completed jobs which have had an invoice sent to the client (either by SMS, e-mail, or InstantPost). To activate the report, go to Settings > ServiceM8 Add-ons. Find "Daily Jobs Completed Report" in the list, and simply click the switch to turn on the report. Note that the report won't post on your Activity Feed until the day and time configured in its Settings (see below). The Jobs Completed report has a single configurable setting, which determines which staff members within your business can see the report when it's posted to your Activity Feed. This is configurable in Settings > Preferences > Reports.